Comic books aren’t just about the images or the words affixed to them. The content within each panel is part of a wider narrative sequence, but the real story comes to life in the margins. As American cartoonist and comics theorist, Scott McCloud puts it, you’re “observing the parts, but perceiving the whole.” To do that, you need the gutter; the blank space between frames. For McCloud, gutters are an “invisible messenger” that invite you to picture what happens in the panels surrounding them. You make a series of instinctive micro decisions and then the action plays out in your mind’s eye. Take a criminal pointing a gun at someone, for instance. And, in the next frame, all we see is an onomatopoeic ‘BANG’ piercing the peaceful night. Did the bullet reach its target? Or did it miss, allowing the would-be victim the chance to flee? It’s in that transitional space between frames, that you decide. 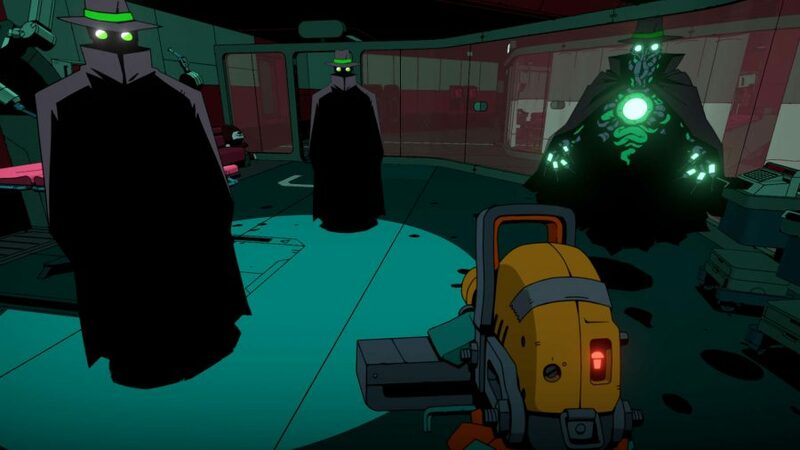 Void Bastards is an FPS from Jonathan Chey – co-founder of System Shock 2 and BioShock studio Irrational Games – and an interactive manifestation of those gutters. 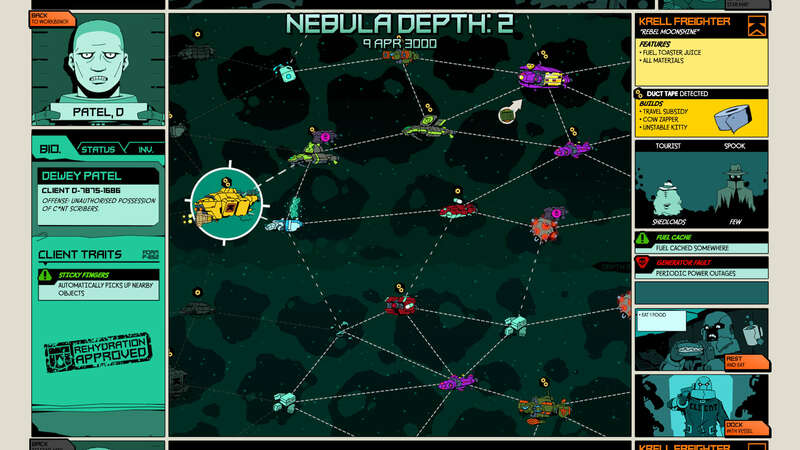 As you lead a series of titular Void Bastards out of the treacherous Sargasso Nebula, scavenging and fighting your way to the resources necessary for your escape, your time in ‘70s punk-inspired deep space is characterised by innumerable micro decisions that mean the difference between survival and permadeath. 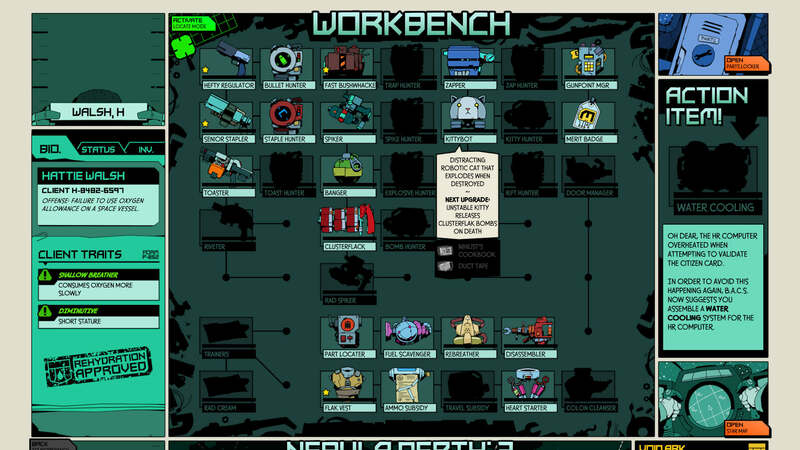 First, though, you must choose your loadout, laid out just like the pages of a graphic novel. Your procedurally-generated escapee is imbued with random perks and flaws, so you’ll need to factor this into your approach. For instance, the negative ‘Smoke’ trait forces your character’s tar-stained throat to cough, possibly alerting enemies to your location in stealth. You have an anarchic arsenal available to mitigate against any such disadvantages: the Clusterflak’s multiple rockets are useful against tougher enemies, and the Toaster can set foes aflame through glass. You’ll acquire these weapons throughout your playthroughs, but you won’t lose them when your character permanently dies and you’re forced back to the beginning. 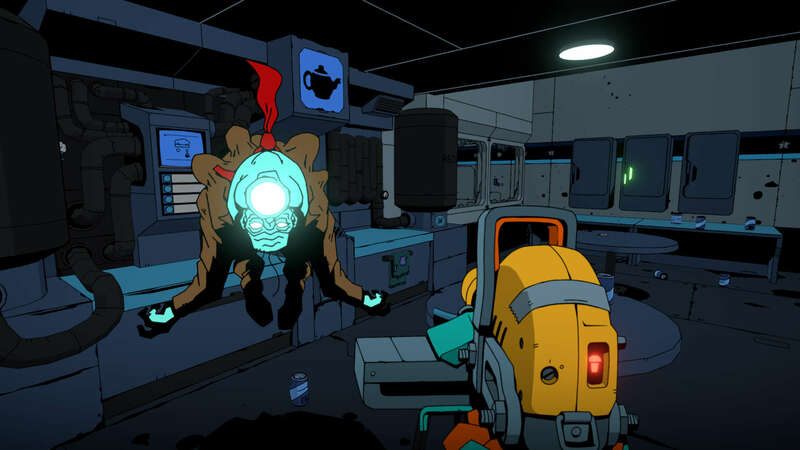 Void Bastards is a ‘strategy shooter’ in which every choice must be arrived at carefully, starting with its FTL-style metagame. Each move you make depletes your food stocks, and you can choose to zoom past a vessel if it doesn’t have the resources you need. Whether your destination is a luxury cruise liner, supply vessel, or a pirate-infested ship, each sortie starts in this way, before you absorb yourself into the frame, and board. You’ll need to still be thinking tactically when you breach, too. Now in first-person, you can make a beeline for your objective, or take out the myriad surveillance cameras that scan their beady metallic eyes for intruders. Sometimes you won’t have the intel on the location of your objective, so you’ll have to use your intuition; you’ll most likely find a crowbar in the hold, for example. 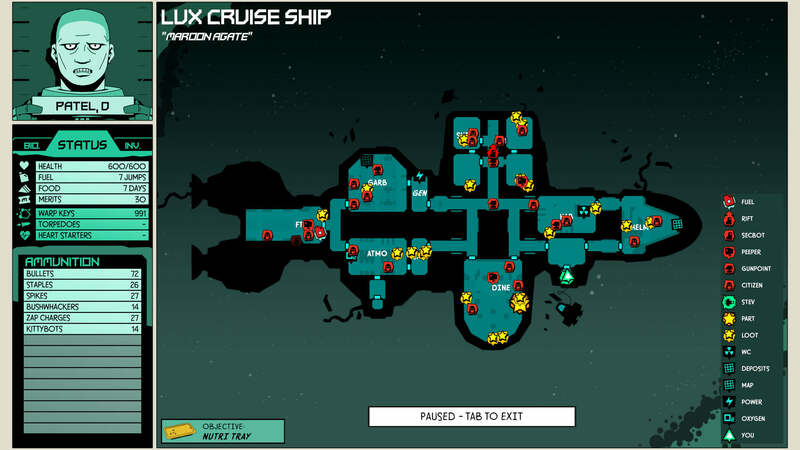 Like your character, each ship layout is procedurally-generated, and you’ll need to quickly gain an intimate knowledge of it to come away unscathed. The notably thick white border around your screen, minimap, and HUD should be jarring when you enter first-person, but it fits well with the game’s distinct graphic novel style. 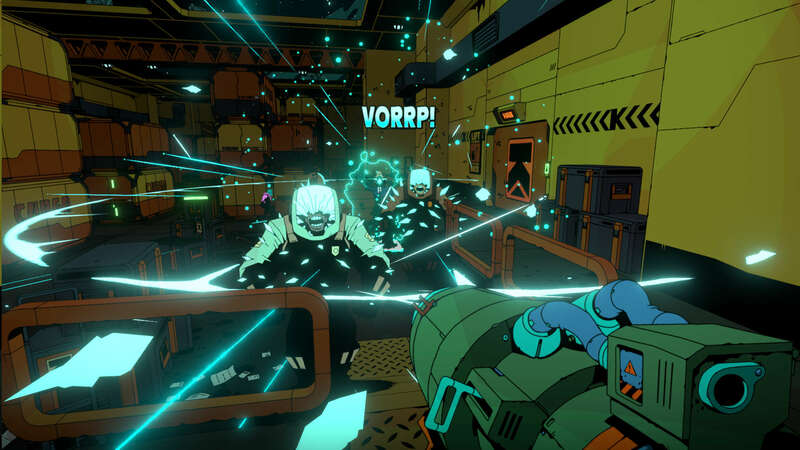 With its bold black outlines and vibrant blocks of colour, Void Bastards recalls Borderlands, but takes the comic cel-shading of Gearbox’s looter shooter up a gear. The adoration of the medium is unmistakable: prompts to open and close doors pop up as speech balloons, stink lines appear when you sprint, and combat comprises a visual chorus of crashes, splooshes, and squelches. It even has a tongue-in-cheek version of the Comics Code Authority stamp emblazoned on the cover: Void Bastards is ‘Cosmic Code inappropriate’. Despite this, art director Ben Lee isn’t your typical collector – but not necessarily by choice. When he was young, and all the other kids were reading Marvel comics, their prohibitive price was unreachable for him. However, an unlikely pricing error paved the way for Void Bastards. Lee’s fascination with science fiction has remained ever since. “I always liked science fiction, but this [2000AD] is what put me into it as a kid. I was really into subversive black comedy, which is what 2000AD really was during the Thatcher period. “That’s what shaped who I was as a teenager and, without 2000AD there wouldn’t be Void Bastards. 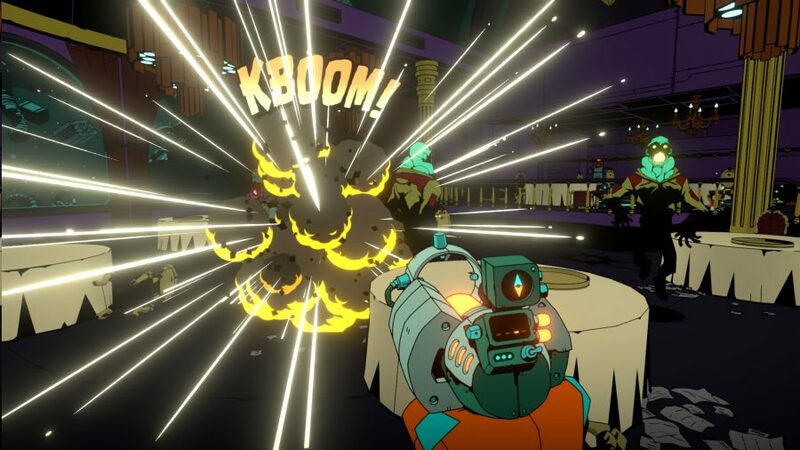 It would probably look more like a Disney cartoon.” With its amusing riffs on British bureaucracy, authoritarianism, and surveillance culture, the ink of the galaxy’s greatest comic is splodged all over this darkly comic FPS. According to Lee, developer Blue Manchu would be “upset” if Void Bastards didn’t release by this summer. 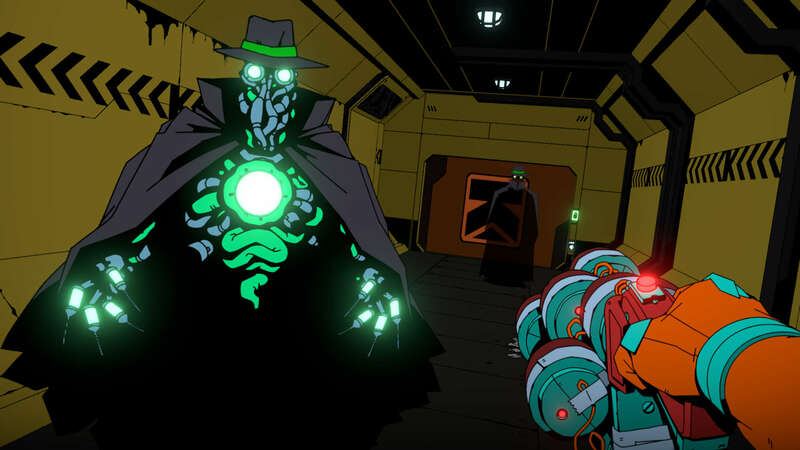 It’s an intriguing time for the team to release the game, given how far Britain appears to be regressing back to a climate the likes of Alan Moore, Dave Gibbons, and Grant Morrison could certainly have fun with. “It’s a bit spooky, how things have swung around,” Lee notes. “ID cards, poll tax, all of that stuff was a really big issue. Now people just very happily tweet their location for free to anyone. It used to be a huge sticking point for the government to have any kind of tracking on you at all.” While Lee insists Void Bastards is not a “preachy” game, he revels in the freedom of working as an independent to tell whatever stories he wants. That’s despite Void Bastards’ launch on Xbox Game Pass. With Lee and his numerically-challenged local newsagent in mind, it’s fitting that more players will have access to this playable comic book than might otherwise have been the case, which can only be an excellent thing as legions of spacefarers take to the yawning emptiness of space and fill in the blanks of Void Bastards’ inviting gutters. Let’s just hope that, when we get there, we can observe Void Bastards’ promising parts and perceive its outrageous, rebellious whole.